My name is Kristin. I am new to this forum. I have been keeping fish for only about 2 years. During that time I have learned alot of information. I am still learning though. I have 3 planted tanks at the moment. 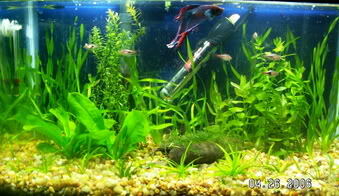 My 55g has tetras, angels, cories, yoyo loaches, ottos, bristlenose, bolivian ram, and a german ram. 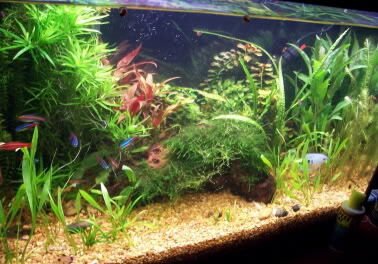 My 29g has tetras, cories, opaline gourami, and ottos. My little 10g has a male betta, harlequin rasboras, and an otto. I will be redoing the 10g soon. I want to heavily plant it and upgrade the lighting. 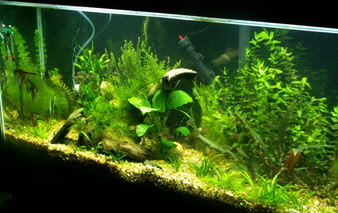 I will be setting up a new 55g planted tank in the next few months. I have so many projects in my head...its a little stressful. But I like setting up new tanks and love the finished products. I am never satisfied with my tanks. I always have to change something! I am in college, majoring in nursing. I still have a couple years to go though. I live in Alabama, its pretty boring here, but we have a few LFS to keep me busy. It needs a little trim and a foreground plant! Welcome to AA!!! Very nice tanks. Welcome to AA! Your tanks are beautiful.